You can listen to a podcast review of this film here, or subscribe to Bina007 Movie Reviews in iTunes. GUARDIAN OF THE GALAXY is hands-down the most fun I've had in a cinema over the past year. It's goofy, funny, smart, touching and at times plain balls-out crazy. But when the lights came up I could have happily sat down to watch the movie all over again, and I can't wait for the sequel. It reminded me of all the reasons we loved cinema as kids - of all those Saturday morning serial inspired movies like STAR WARS and INDIANA JONES with their epic quests and buddy comedy relationships. But even better, it reminded me of the richly imagined almost gothic worlds of Guillermo del Toro movies - worlds where people (and raccoons!) look battered and beaten rather than shiny and new. There was something nostalgic about the very concept of the movie - a throwback to the great eighties action comedies - that went beyond its hokey mix-tape seventies sound-track. I mean, I CARED about the talking tree and the psycho-raccoon, god help me. And I want to know what happens next! The story is taken from the Marvel comics reboot of the superhero series that began in the late 1990s. Peter Quill (a newly buff Chris Pratt) was abducted by alien mercenaries when his mum died of cancer back in the early 80s and has grown up to be a goofy but effective inter-galactic thief. In the present day he goes on the hunt for a MacGuffin that everybody - good guys, bad guys, Collectors - is after. It's only after the first hour of the film and epic friendship-making jail-break that we realise the significance of "the orb" and see our band of misfits journey across the galaxy to ensure that it isn't used to destroy the people of Nova. 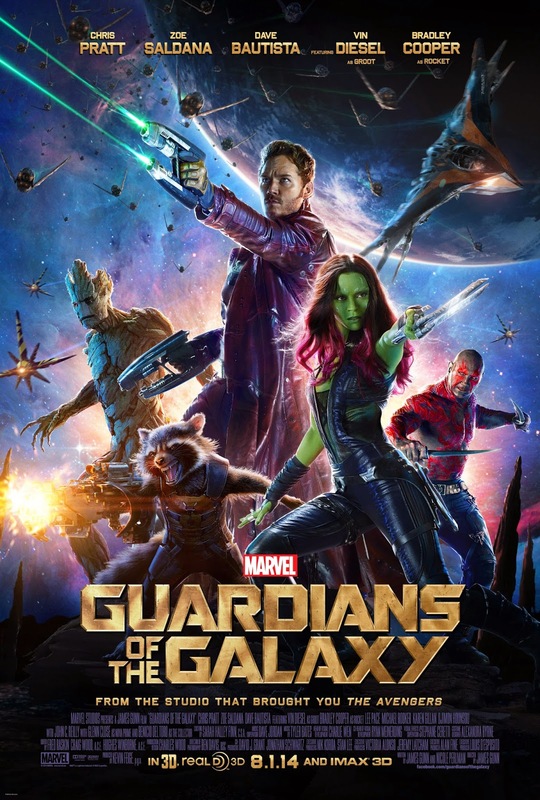 They include an adopted daughter of the bad guy, Thanos, called Gamora (Zoe Saldana); a vengeful strongman with a heart of gold called Drax (David Bautista); the aforementioned talking super-tree called Groot (Vin Diesel); and a fast-talking MacGyver-style mutant Raccoon called Rocket (Bradley Cooper). What I love about this film is that the Guardians have real chemistry and the movie has the gonzo feel of an A-team episode combined with all the lavish special effects and production design you'd expect from a Marvel movie. Just looking at the intricate carvings on Drax's body, or the Glenn Closes costumes as Nova Prime is worth the price of admission of itself. But the biggest surprises were the performances. Director James Gunn was absolutely right to back Parks and Recreation's schlubby Chris Pratt as his action hero, because what sells the character isn't his six-pack but his sense of humour. Who knew Davd Bautista could play the comedy straight-man? And who knew Vin Diesel could bring so many inflections to this "I am Groot" line? As for Bradley Cooper and Zoe Saldana - they largely play to type, but that's not to denigrate their performances either. All in all, I loved every minute of GUARDIANS OF THE GALAXY and I predict it triggers a hipster trend for reconditioning old walkmans. This will be a small but irritating price to pay for what is the weirdest but arguably best installment in the Marvel franchise to date. Yes, bold words, but I stand by them! GUARDIANS OF THE GALAXY has a running time of 121 minutes and is rated PG-13 in the USA and 12A in the UK for moderate fantasy action violence, threat and moderate bad language. GUARDIANS OF THE GALAXY is released on July 31st in Argentina, Australia, Azerbaijan, Brazil, Chile, Denmark, the UK, Hong Kong, Ireland, Israel, South Korea, Macedonia, Mexico, Malaysia, Peru, the Philippines, Singapore, Slovenia and Slovakia. It is released on August 1st in the USA, Canada, Estonia, Finland, Lithuania, Norway, Poland, Romania, Sweden, Turkey and Vietnam. It's released on August 7th in Cambodia, New Zealand, Portugal and Serbia; on August 8th in Bulgaria, India, Mexico and Venezuela; on August 13th in Belgium and France; on August 14th in Spain, Hungary and the Netherlands; on August 28th in Germany; on September 4th in Greece; on September 13th in Japan and on October 22nd in Italy. Poor Italy!